Cornish Inventor and Mining Engineer Richard Trevithick sadly passed away 22 April 1833 at the Bull Hotel, Dartmouth. He was born 13 April 1771 in Tregajorran, Cornwall and his most significant success was the high pressure steam engine and he also built the first full-scale working railway steam locomotive. On 21 February 1804 the world’s first locomotive-hauled railway journey took place as Trevithick’s unnamed steam locomotive hauled a train along the tramway of the Penydarren Ironworks, near Merthyr Tydfil in Wales. Trevithick was an engineer at a mine in 1797 when he, with the help of Edward Bull pioneered the use of a High Pressure Steam Engine, but ran afoul of Matthew Boulton & James Watt, who were working on a similar device and held a number of Patents. As his experience grew, he realised that improvements in boiler technology now permitted the safe production of high pressure steam, which could move a piston in a steam engine on its own account, instead of using pressure near to atmospheric in condensing engines. He was not the first to think of so-called “strong steam”. William Murdoch had developed and demonstrated a model steam carriage, starting in 1784, and demonstrated it to Trevithick at his request in 1794. In fact, Trevithick lived next door to Murdoch in Redruth in 1797 and 1798. Oliver Evans in the U.S. Was working on something similar but his never come to Trevithick’s attention. Arthur Woolf was also experimenting with higher pressures whilst working as the Chief Engineer of the Griffin Brewery. This was an Engine designed by Hornblower and Maberly, and the proprietors were keen to have the best steam engine in London. Around 1796 Woolf had agreed to save substantial amounts on coal consumption. According to his son Francis, Trevithick was the first to make high pressure steam work in England, in 1799. Not only would a high pressure steam engine eliminate the condenser, but it would allow the use of a smaller cylinder, saving space and weight. He reasoned that his engine could now be more compact, lighter and small enough to carry its own weight even with a carriage attached. 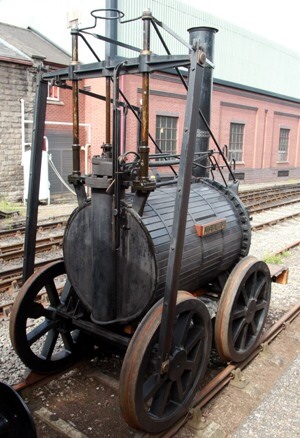 Trevithick started building his first models of high pressure steam engines, initially a stationary one and then one attached to a road carriage. A double-acting cylinder was used, with steam distribution by means of a four-way valve. Exhaust steam was vented via a vertical pipe or chimney straight into the atmosphere, thus avoiding a condenser and any possible infringements of Watt’s patent. The linear motion was directly converted into circular motion via a crank instead of a beam. Trevithick built a full-size steam road locomotive in 1801 on a site near the present day Fore Street at Camborne. He named the carriage ‘Puffing Devil’ and, on Christmas Eve that year, he demonstrated it by successfully carrying several men up Fore Street and then continuing on up Camborne Hill, from Camborne Cross, to the nearby village of Beacon with his cousin and associate, Andrew Vivian, steering. This is widely recognised as the first demonstration of transportation powered by steam, and it later inspired the popular Cornish folk song “Camborne Hill”. 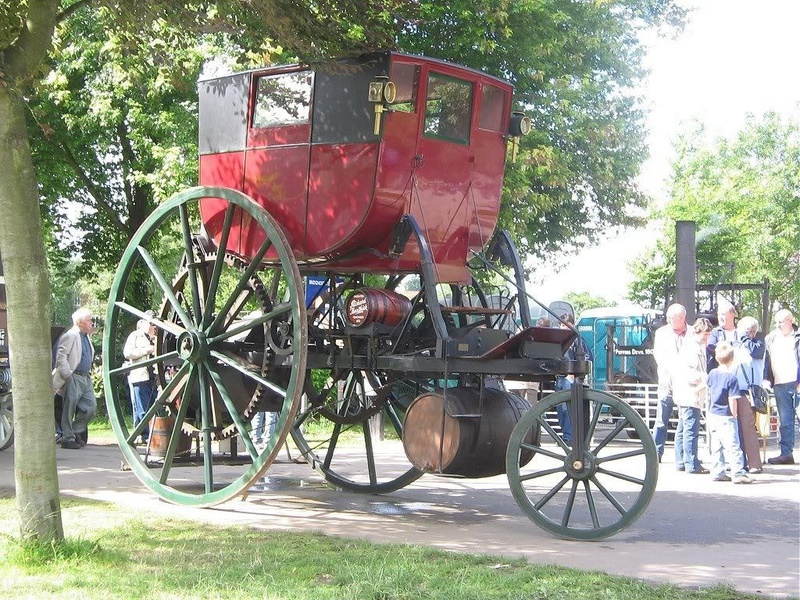 However, a steam wagon built in 1770 by Nicolas-Joseph Cugnot may have an earlier claim. During further tests, Trevithick’s locomotive broke down three days later, after passing over a gully in the road. The vehicle was left under some shelter with the fire still burning whilst the operators retired to a nearby public house for a meal of roast goose and drinks. Meanwhile the water boiled off, the engine overheated and the machine burned, destroying it. Trevithick did not consider this a serious setback, but rather operator error. In 1802 Trevithick took out a patent for his high pressure steam engine. To prove his ideas, he built a stationary engine at the Coalbrookdale Company’s works in Shropshire in 1802, forcing water to a measured height to measure the work done. The engine ran at forty piston strokes a minute, with an unprecedented boiler pressure of 145 psi. The Coalbrookdale company then built a rail locomotive for him, but little is known about it, including whether or not it actually ran. To date, the only known information about it comes from a drawing preserved at the Science Museum, London, together with a letter written by Trevithick to his friend, Davies Giddy. The design incorporated a single horizontal cylinder enclosed in a return-flue boiler. A flywheel drove the wheels on one side through spur gears, and the axles were mounted directly on the boiler, with no frame. Unfortunately it was found that The Puffing Devil was unable to maintain sufficient steam pressure for long periods, and would have been of little practical use. In 1803 he built another steam-powered road vehicle called the London Steam Carriage, which attracted much attention from the public and press when he drove it that year in London from Holborn to Paddington and back. It was uncomfortable for passengers and proved more expensive to run than a horse-drawn carriage and so the project was abandoned. In 1802 Trevithick built one of his high pressure steam engines to drive a hammer at the Pen-y-Darren Ironworks in Merthyr Tydfil, South Wales. With the assistance of Rees Jones, an employee of the iron works and under the supervision of Samuel Homfray, the proprietor, he mounted the engine on wheels and turned it into a locomotive. In 1803 Trevithick sold the patents for his locomotives to Samuel Homfray. The locomotive was of a primitive design. It comprised a boiler with a single return flue mounted on a four wheel frame. At one end, a single cylinder with very long stroke was mounted partly in the boiler, and a piston rod crosshead ran out along a slidebar, an arrangement that looked like a giant trombone. As there was only one cylinder, this was coupled to a large flywheel mounted on one side. The rotational inertia of the flywheel would even out the movement that was transmitted to a central cog-wheel that was, in turn connected to the driving wheels. It used a high pressure cylinder without a condenser, the exhaust steam was sent up the chimney assisting the draught through the fire, increasing efficiency even more. Despite many people’s doubts, it had been shown that, provided that the gradient was sufficiently shallow, it was possible to successfully haul heavy carriages along a “smooth” iron road using the adhesive weight alone of a suitably heavy and powerful steam locomotive. Trevithick’s was probably the first to do so; however some of the short cast iron plates of the tramroad broke under the locomotive as they were intended only to support the lighter axle load of horse-drawn wagons and so the tramroad returned to horse power after the initial test run. The proprietor of the Wylam colliery near Newcastle, heard of the success in Wales and wrote to Trevithick asking for locomotive designs. These were sent to John Whitfield at Gateshead, Trevithick’s agent, who built what was probably the first locomotive to have flanged wheels. Unfortunately wooden rails were used for his tramway and, once again, and Trevithick’s machine was to prove too heavy for its track. Then In 1808 Trevithick publicised his steam railway locomotive expertise by building a new locomotive called ‘Catch me who can’, built for him by John Hazledine and John Urpeth Rastrick at Bridgnorth in Shropshire, This was similar to that used at Penydarren and named by Mr. Giddy’s daughter. This was Trevithick’s third railway locomotive after those used at Pen-y-darren ironworks and the Wylam colliery. He ran it on a circular track just south of the present day Euston Square tube station in London, Admission to the “steam circus” was one shilling including a ride and it was intended to show that rail travel was faster than by horse. This venture also suffered from weak cast Iron tracks and public interest was limited. 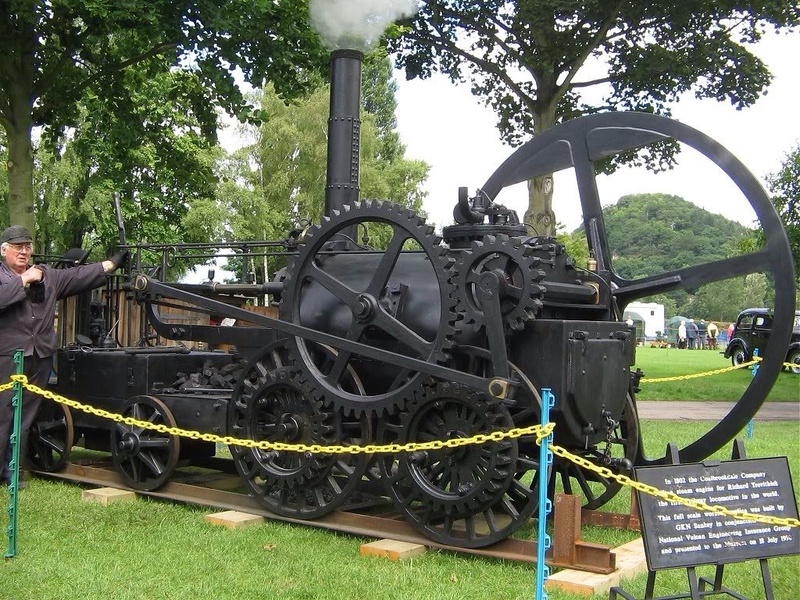 Trevithick was disappointed by the response and designed no more railway locomotives, However a group of dedicated people down at the Severn Valley Railway decided to build a replica of Catch-Me-Who-Can. In 1805 Robert Vazie, another Cornish engineer, was selected by the Thames Archway Company to drive a tunnel under the River Thames at Rotherhithe. Vazie encountered serious problems with water influx and got no further than sinking the end shafts when the directors called in Trevithick for consultation. The directors agreed to pay Trevithick £1000 (the equivalent of £67,387 as of 2014). he could successfully complete the tunnel, a length of 1220 feet (366 m). In August 1807 Trevithick began driving a small pilot tunnel or driftway 5 feet (1.5 m) high tapering from 2 feet 6 inches (0.75 m) at the top to 3 feet (0.9 m) at the bottom. By 23 December after it had progressed 950 feet (285 m) progress was delayed after a sudden inrush of water and only one month later on 26 Jan 1808, at 1040 feet (312 m), a more serious inrush occurred. The tunnel was flooded and Trevithick, being the last to leave, was nearly drowned. Clay was dumped on the river bed to seal the hole and the tunnel was drained but mining was now more difficult. Progress stalled and a few of the directors attempted to discredit Trevithick but the quality of his work was eventually upheld by two colliery engineers from the North of England. Despite suggesting various building techniques to complete the project, including a submerged cast iron tube, Trevithick’s links with the company ceased and the project was never actually completed. The first successful tunnel under the Thames would be started by Sir Marc Isambard Brunel in 1823, 0.75 miles (1,200 m) upstream, assisted by his son Isambard Kingdom Brunel (who also nearly died in a tunnel collapse). Marc Brunel finally completed it in 1843, the delays being due to problems with funding. Trevithick’s suggestion of a submerged tube approach was successfully implemented for the first time across the Detroit River in Michigan with the construction of the Michigan Central Railway Tunnel, under the engineering supervision of The New York Central Railway’s engineering vice president, William J Wilgus. Construction began in 1903 and was completed in 1910. The Detroit–Windsor Tunnel which was completed in 1930 for automotive traffic, and the tunnel under the Hong Kong harbour were also submerged tube designs. Trevithick went on to research other projects to exploit his high-pressure steam engines: boring brass for cannon manufacture, stone crushing, rolling mills, forge hammers, blast furnace blowers as well as the traditional mining applications. He also built a barge powered by paddle wheels and several dredgers. Trevithick saw opportunities in London and persuaded his wife and 4 children reluctantly to join him in 1808 for two and a half years lodging first in Rotherhithe and then in Limehouse. In 1808, Trevithick entered a partnership with Robert Dickinson, a West India merchant. Dickinson supported several of Trevithick’s patents. The first of these was the ‘Nautical Labourer’; a steam tug with a floating crane propelled by paddle wheels. A patent was taken out for the installation of iron tanks in ships for storage of cargo and water instead of in wooden casks. A small works was set up at Limehouse to manufacture them, employing 3 men. The tanks were also used to raise sunken wrecks by placing them under the wreck and creating buoyancy by pumping them full of air. In 1810 a wreck near Margate was raised in this way but there was a dispute over payment and Trevithick was driven to cut the lashings loose and let it sink again. In 1809, Trevithick worked on various ideas on improvements for ships: iron floating docks, iron ships, telescopic iron masts, improved ship structures, iron buoys and using heat from the ships boilers for cooking. In May 1810, he caught typhoid and nearly died. By September, he had recovered sufficiently to travel back to Cornwall by ship and in February 1811 he and Dickinson were declared bankrupt. They were not discharged until 1814, Trevithick having paid off most of the partnership debts from his own funds.In about 1812, Trevithick designed the ‘Cornish boiler’. These were horizontal, cylindrical boilers with a single internal fire tube or flue passing horizontally through the middle. Hot exhaust gases from the fire passed through the flue thus increasing the surface area heating the water and improving efficiency. These types were installed in the Boulton and Watt pumping engines at Dolcoath and more than doubled their efficiency. Again in 1812, he installed a new ‘high-pressure’ experimental steam engine also with condensing at Wheal Prosper. This became known as the ‘Cornish engine’ and was the most efficient in the world at that time. Other Cornish engineers contributed to its development but Trevithick’s work was predominant. In the same year he installed another high-pressure engine, though non-condensing, in a threshing machine on a farm at Probus, Cornwall. It was very successful and proved to be cheaper to run than the horses it replaced. It ran for 70 years and was then exhibited at the Science Museum. In one of Trevithick’s more unusual projects, he attempted to build a ‘recoil engine’ similar to the aeolipile described by Hero of Alexandria in about AD 50. Trevithick’s engine comprised a boiler feeding a hollow axle to route the steam to a catherine wheel with two fine-bore steam jets on its circumference. The first wheel was 15 feet (4.6 m) in diameter and a later attempt was 24 feet (7.3 m) in diameter. To get any usable torque, a large volume of steam was required at a high velocity which proved difficult to achieve. Today this would be recognised as a reaction turbine. Around 1811 a miner, named Francisco Uville who had experienced serious problems draining water from the high altitude of his rich sliver mines of Cerro de Pasco Peru, sailed to England to investigate using Trevithick’s high-pressure steam engine. He bought one for 20 guineas, transported it back and found it to work quite satisfactorily. In 1813 Uville set sail again for England and, having fallen ill on the way, broke his journey via Jamaica. When he had recovered he boarded the Falmouth packet ship ‘Fox’ coincidentally with one of Trevithick’s cousins on board the same vessel. Trevithick’s home was just a few miles from Falmouth so Uville was able to meet him and tell him about the project. On 20 October 1816 Trevithick left Penzance on the whaler ship Asp accompanied by a lawyer named Page and a boilermaker bound for Peru. He was received by Uville with honour initially but relations soon broke down and Trevithick left in disgust at the accusations directed at him. He travelled widely in Peru acting as a consultant on mining methods. The government granted him certain mining rights and he found mining areas, but did not have the funds to develop them, with the exception of a copper and silver mine at Caxatambo. After a time serving in the army of Simon Bolivar he returned to Caxatambo but due to the unsettled state of the country and presence of the Spanish army he was forced to leave the area and abandon £5000 worth of ore ready to ship. Uville died in 1818 and Trevithick soon returned to Cerro de Pasco to continue mining. However, the war of liberation denied him several objectives. Meanwhile, back in England, he was accused of neglecting his wife Jane and family in Cornwall. After leaving Cerro de Pasco, Trevithick passed through Ecuador on his way to Bogotá in Colombia. He arrived in Costa Rica in 1822 hoping to develop mining machinery. He spent time looking for a practical route to transport ore and equipment, settling on using the San Juan River, the Sarapiqui River, and then a railway to cover the remaining distance. In a biography his son wrote that Trevithick had in mind a steam-driven railway and not mule-driven. The journey was treacherous – one of the party was drowned in a raging torrent and Trevithick was himself nearly killed on at least two occasions – he nearly drowned, and was nearly devoured by an alligator. He made his way to Cartagena where he met Robert Stephenson who was on his way home from Colombia. It had been many years since they last met (when Stephenson was just a baby). Stephenson gave Trevithick £50 to help his passage home. He arrived at Falmouth in October 1827 with few possessions other than the clothes he was wearing. Trevithick never returned to Costa Rica. In 1829 Trevithick built a closed cycle steam engine followed by a vertical tubular boiler. In1830 he invented an early form of storage room heater. It comprised a small fire tube boiler with a detachable flue which could be heated either outside or indoors with the flue connected to a chimney. To commemorate the passing of the Reform Bill in 1832 he designed a massive column to be 1000 feet (300 m) high, being 100 feet (30 m) in diameter at the base tapering to 12 feet (3.6 m) at the top where a statue of a horse would have been mounted. It was to be made of 1500 10-foot-square (3 m) pieces of cast iron and would have weighed 6000 tons. but it was never built. About the same time he was invited to do some development work on an engine of a new vessel at Dartford, The work involved a reaction turbine for which Trevithick earned £1200. He lodged at The Bull hotel in the High Street, Dartford, Kent. Sadly though Richard Trevithick died April 22 1833 at the Bull Hotel, Dartford and was carried here by fellow workers of Halls Engineering Works. To a paupers grave in April 22nd 1833″. After he had been working in Dartford for about a year, Trevithick was taken ill with pneumonia and Following a week’s confinement in bed he died penniless the morning of 22 April 1833, and no relatives or friends had attended his bedside during his illness. His colleagues at Hall’s works made a collection for his funeral expenses and acted as bearers. They also paid a night watchman to guard his grave at night to deter grave robbers, as body snatching was common at that time. Trevithick was buried in an unmarked grave in St Edmunds Burial Ground, East Hill, Dartford, today A plaque marks the approximate spot believed to be the site of the grave. 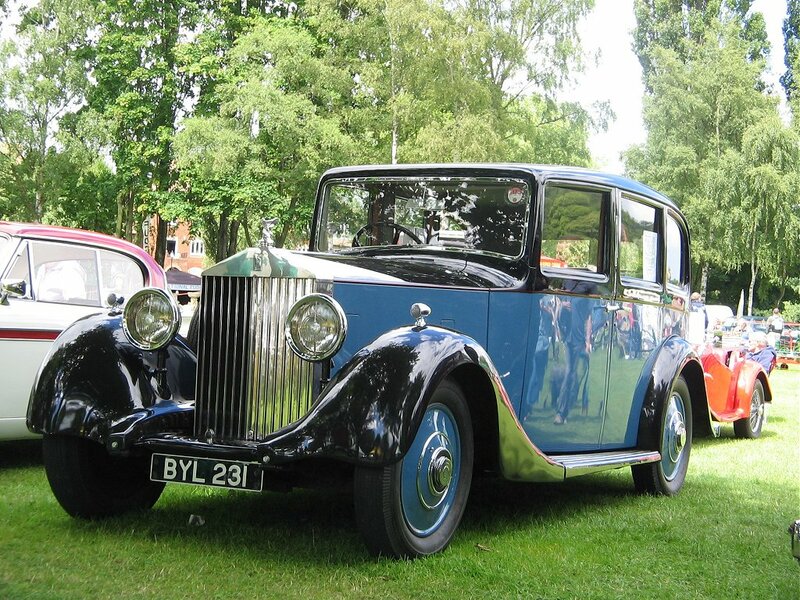 Henry Royce the co- founder of World Renowned Luxury Car Manufacturer Rolls-Royce sadly passed away 22 April 1933. Born 27th March 1863 in Alwalton, Huntingdonshire, near Peterborough, he was the youngest of their five children. His family ran a flour mill which they leased from the Ecclesiastical Commissioners but the business failed and the family moved to London. His father died in 1872 and Royce had to go out to work selling newspapers and delivering telegrams, having had only one year of formal schooling. In 1878 he started an apprenticeship with the Great Northern Railway company at its works in Peterborough thanks to the financial help of an aunt. After three years the money ran out and, after a short time with a tool-making company in Leeds, he returned to London and joined the Electric Light and Power Company. He moved to their Liverpool office in 1882working on street and theatre lighting. In 1884 with £20 of savings he entered a partnership with Ernest Claremont, a friend who contributed £50, and they started a business making domestic electric fittings in a workshop in Cooke Street, Hulme, Manchester, called F H Royce and Company. In 1894 they started making dynamos and electric cranes and F.H. Royce & Company was registered as a limited liability company. 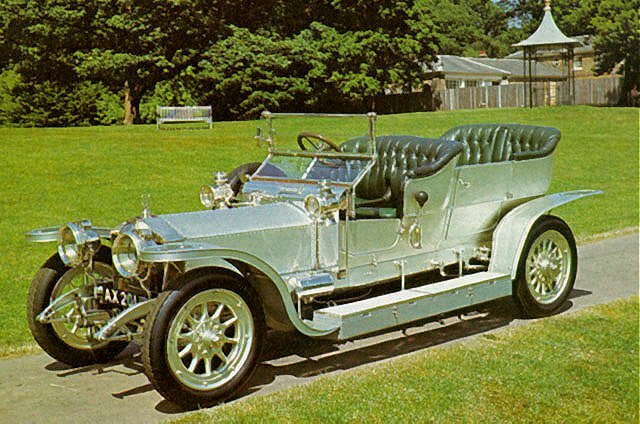 The company was re-registered in 1899 as Royce Ltd with a public share flotation and a further factory opened in Trafford Park, Manchester. international Mother Earth Day is an annual event, celebrated on April 22, to increase awareness and appreciation of the Earth’s natural environment.It was first celebrated in 1970, and is now coordinated globally by the Earth Day Network, and celebrated in more than 192 countries each year. The name and concept of Earth Day was allegedly pioneered by John McConnell in 1969 at a UNESCO Conference in San Francisco. Earth Day was first observed in San Francisco and other cities on March 21, 1970, the first day of spring in the northern hemisphere. To mark the occasion many events are held worldwide. Earth Day is now coordinated globally by the Earth Day Network, and is celebrated in more than 175 countries every year. In 2009, the United Nations designated April 22 International Mother Earth Day.